As a small business owner, a good marketing strategy will drive your business. Most of us are not fortunate enough to have the background and training to create and maintain a professional website and therefore we must invest the time and money. The website typically is the one tool that is underused by the majority of companies. It is designed. It is built. It is alive! But now what! Let’s investigate the ways a professionally designed, well organized, comprehensive website is an center of your marketing strategy. The majority of consumers these days are tech-savvy and usually their first exposure is through your website. Word of mouth, social media, or a search engine may be how they first hear of your company’s existence, but ultimately, most consumers will explore a website before visiting a business in person. If your website is not consumer-friendly, or difficult to find, you are turning valuable consumers back to your competition (you know, the ones with a great, easy-to-use website!). When a potential customer comes across your website, make sure they are met with a great first impression. Make sure they understand the ‘Next Step.’ Is it interactive and inviting? Can they find the information they need? Is it mobile friendly? These are questions that you need to consider as your customer’s first contact with your company is your website. Your Website Does Not Need to Be Crazy Expensive. Most business owners are not computer specialists and designers and I will admit that there are some really nice free websites out there and I’ll give them a shout-out here: SquareSpace.com and WordPress.com. I offer template-based websites on a WordPress platform that offers a very nice, clean, professional layout. But typically these inexpensive websites are great for the beginning company and the entrepreneur just starting out. I recommend to my clients to not spend too much money on a really intensive, custom designed website (I know.. really? I recommend a low-cost website? Yes.. I do). My thinking is that you need to put your money into getting people to your website. Don’t get me wrong though; it still needs to have that inviting, clear, intuitive interface that I talk about earlier. But I digress, unless your budget allows for it… I recommend an inexpensive website first then later as you grow and need specific features and outcomes and better branding, come back and lets talk. So… lets talk… it’s time for that next level website. You need a web designer to complete this part of your investment. When working with a web designer there are a few things to keep in mind. Your web designer needs to be a professional with whom you can communicate succinctly and precisely. They must be able to translate your marketing vision into a website that is user-friendly, eye-catching, and focused on your brand. Throughout the process it is vital that your designer understands the finer distinctions of a properly working website, not just a proper looking website. As you work with your designer, the end-product might be different than your original vision, but, as long as the process is done in collaboration and leads to the best website for your business the time and money investment will pay-off. When interviewing web developers, watch your conversations with them during the interview process. Are they easy to talk to? Do they interrupt? Are they willing to work with your ideas? Take these cues and choose based on your relationship as well as cost and design skills. You’ll be working this person for a while. Other than yourself, your web designer is the other singly important person in assisting you in developing your individual brand and on-line presence. In today’s technology-centered world, your website, being the center of your strategy will have branches that extend out to your email, social, print, and paid clicks. In each strategy session, your brand and message need to be reflected. The majority of small business owners make one critical mistake in their marketing strategies; they do not focus on developing their brand. Giving this priority will refine your marketing and will put you ahead of many of your competitors. I won’t go into how to build your brand just make sure that as you put your strategy together, your brand should be built across all aspects and marketing arms. Ask yourself, “Will this reflect our brand in the best way?” If the answer is no, or you’re not sure, re-consider including it or making the change. There might be some key choices made in collaboration with your web designer will have a huge impact on your website. 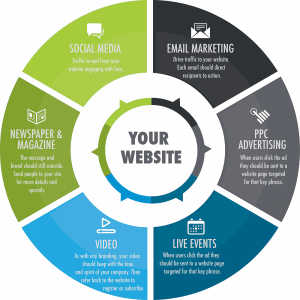 Often, your website will include links to your social media pages while your social media posts will drive traffic to your website. Your website will be sending emails with a subscription form to your email marketing software. Your print ads in magazine might have a prepared message that, when people access your website it should match the print ad with the same message. Maybe even more specific and include the same photo, text, etc. When you are in a tradeshow, and you pass out your business card or flyers or brochures, what is the next step? Well, typically, they go to your website to learn more or to take the next step. Where your audience is located. United States? Canada? How they got your website. Did they type in your web address? Did they come from another web site? Are they avid readers and news junkies? What platform was most used to visit your website, i.e., mobile, desktop, Windows 7, Mac, etc. What they did next after reaching your web page. The ability to collect these statistics, interpret them, and adjust your marketing strategy accordingly can drive your business to the next level of success. But as your pass out your flyer with web address and a special coupon they can print, this can be tracked. But, your website is only going to be successful if it is being regularly analyzed. Investment into the success of your company is a fine balance, especially, for small businesses. In today’s world, the singly most valuable tool used to drive your marketing strategy and grow your business is a user-friendly, professionally designed, well thought-out website. Hiring and working in close collaboration with a professionally trained Web Designer who is knowledgeable about the finer nuances of a well-working website will result in a personalized website that will fulfill both your customers’ needs and marketing strategy vision. Once your website is up and “live”, analyzing the wealth of statistics collected daily, weekly, and monthly is imperative in keeping your website and your marketing strategy moving forward. The success of any business lays in its marketing strategy; success of your marketing strategy largely lays in a professionally designed website. Investing time and money into this one tool will be rewarded with your brand’s growing success. One of the biggest features to highlight on your website is how your customers can sign up to be on your business’ email list. The statistics supporting email marketing are staggering! As this information indicates, an email marketing list is crucial to growing your brand. Depending on your individual business the data also supports creating a strong social identity will greatly drive your marketing strategy. As part of your brand, your website, much like a blog, will have a “voice” or “tone.” Will it be a professional, eloquent voice, or a casual, conversational tone? This carries over into the design. With a design and tone, focus on what features your website will include to help advance your marketing strategy and overall brand.